Southwest High School running back Thomas Sughroue (33) finds running room on the sideline on this kickoff return against the Hayes Center Cardinals last Friday night. 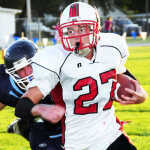 Host Southwest downed the Cards, 38-14, on the Roughriders home field in Bartley. Grant Strunk/McCook Daily Gazette Hayes Center running back Michael Bishop (27) slips past the reach of an unidentified Southwest defender and looks downfield for extra yards Friday night.